We operate a full-service hockey pro-shop conveniently located inside Calgary's Vivo (formerly Cardel Place) arena. Our space may be small, but we have quickly become Calgary's #1 choice for consistent, reliable, professional skate sharpening and repairs. We are also Calgary's trusted provider for jerseys, team uniforms, and sport, school or corporate apparel for every application. 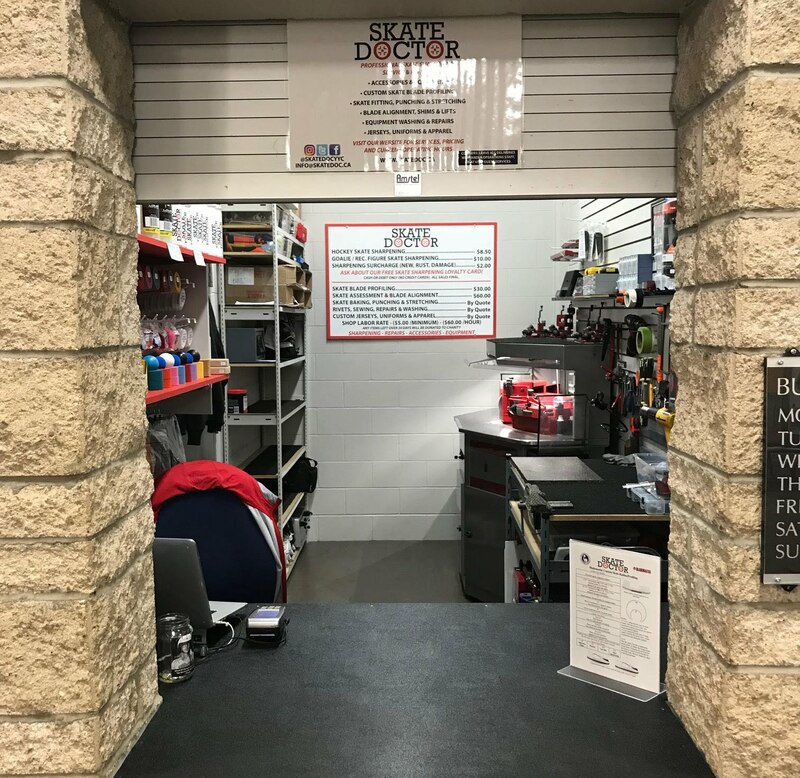 Why go out of your way to get your skates sharpened, when you can get a professional quality sharpening at the rink before your game, practice or tournament? We use NHL-grade skate sharpening machines and sharpen your skates like the pros. We sharpen while you wait - or leave your skates with us and pick them up later. Head Equipment Manager for the University of Calgary Dinos men's hockey team and a Pro Services Representative for TRUE Hockey, servicing countless professional players and teams in the NHL, AHL, ECHL, WHL, Junior hockey system and internationally. He has also previously worked with the New Zealand Ice Blacks national hockey team. His experience does not stop at hockey - he has also worked with ringette players, also up to and including the professional level. Our other Skate Technicians are personally trained and mentored before performing any services. You can rest assured that only the most-qualified Skate Technicians are behind our equipment and working on your gear. Our reputation is built upon providing you the best service and quality of work. You can also book our mobile services for your practice, game, team event, tournament or league. Our professional and experienced staff come to you to deliver an uncompromised level of service and quality. If you'd rather have the work performed at our shop, check out our Team/Group Sharpening services, suitable for 10 pairs or more with pick-up/drop-off service available at an additional charge.